Sharon Drew Morgen » The Internal Customer: Is It A Sales Job? The Internal Customer: Is It A Sales Job? What is the difference between selling to an internal customer and selling to an external customer? At the end of the day, there is the buyer, the seller, and the solution. The influencer, the influenced, and the idea, or request. Regardless of the moving parts, one person wants another person to buy in to something that represents some sort of change. Whenever we are responsible for having someone else buy in to an idea, change an opinion, help us on a project, we have a sales issue. But it’s not the sort of sales issue we’re accustomed to. It’s a change management issue: after all, if the Other can’t figure out a way to add our request to their daily activities, their beliefs about their job, their feelings about what is being asked of them, they will do nothing. If we force them to do something they are not internally comfortable with, we’ll have to manage their sabatoge. In order for a colleague to buy in to an idea or help us in some way, they need to be willing to make a decision to do something different. Sure, we have a worthwhile project that we can spout about (all our projects are worthwhile, right? ); we can offer details, and great reasons why it’s a worthy use of time or money. But at the end of the day, the person has to agree – and not just agree, but lend a hand, be willing to support us over time, be available to influence someone else. We actually need them to get on board and become part of the team (even if in a small way). We actually have a leaderhip issue. We are so accustomed to assuming that because our product/solution/idea is great, and we can see the benefits, that the other person will see the efficacy of it and work with us. But agreeing means they have to have risk: they risk their time, their political capital, their relationships, their ‘name’. Net net, they have a subjective, personal, internal decision to make that must meet their own criteria for who they are in the workplace. It’s not just about the request or the need or the idea/solution. 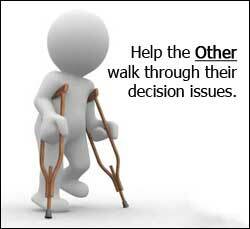 Help the Other walk through their decision issues. Once they buy in to giving up some of their time, recognizing what they need to consider to maintain their company status, seeing if they can stand behind the request in a way that integrates with their personal issues, then they can make the personal decisions necessary to stand behind our request. It’s not about the efficacy of the idea or the solution: it’s about the Other’s need to buy in to a collaboration. Stop selling. Teach the Other how to buy.